They helped him find his real family. … and decided to follow the first moving thing he could find, which happened to be a blue car driving in front of the couple. The car in front of them continued to drive along — and the little wildebeest continued to follow it for several miles. The couple was worried about the calf’s safety, as he was trotting through potential predator territory, and so they followed closely behind to keep an eye on him. After getting a little confused with several cars passing by, the calf suddenly decided to follow the couple’s car instead. He even tried suckling on the car’s tires, more confused than ever. 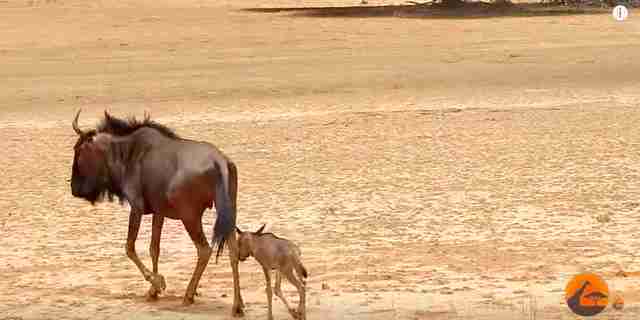 Finally, after driving several more miles, a herd of wildebeest appeared, and the mother of the lost calf immediately noticed him running along the road. She hurried toward him, and, within seconds, they were finally reunited. Once back with his mom, the little wildebeest was no longer confused, and happily chased after her as she led him back to their herd at last.